I don't know about you, but I am always curious about how other people organize things and how they do things in their house. It is fun to look in and see how they decorate and organize. 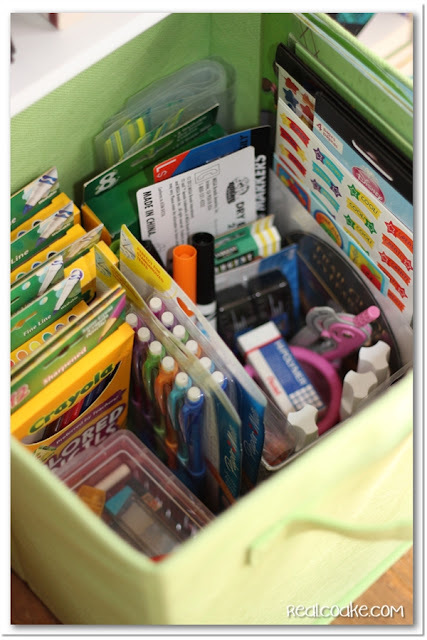 As a homeschooling mom, I always enjoy seeing how other people organize their school supplies or if they have a school room, what they have done in there. Today, I'm going to show you our homeschool organization. for some additional room. This year, I didn't add anything (well I added one basket), but I rearranged everything and added some glam to our school area. As with any organization project, I started by assessing what I had and how I had things configured. As you can see, before I had the bookcases separated from each other across the room. It worked find, but I always like to try new things. The shelves had also become a bit overrun as is the tendency throughout the school year. A good purge was in order. Start your own organization project, by pulling everything out of the area you intended to organize. Go through everything. This may seem like a pain, but if you are going to really organize it, you need to know what you have and keep only what you really need and love. I had a bunch of things that we needed to get rid of. I had a lot that I was saving because we were hoping for a third child, but we now know we won't be adding any more kids, so it is time get rid of the things for younger kiddos. When you have this big mess on the floor, take the time to sort like things together. Group things by ages or subject so that they are together and will thus be easier to find. Once you have done all the hard work, you get the fun of putting things in their new home. Yay! I moved the smaller of the two shelves over across the room so everything is together. 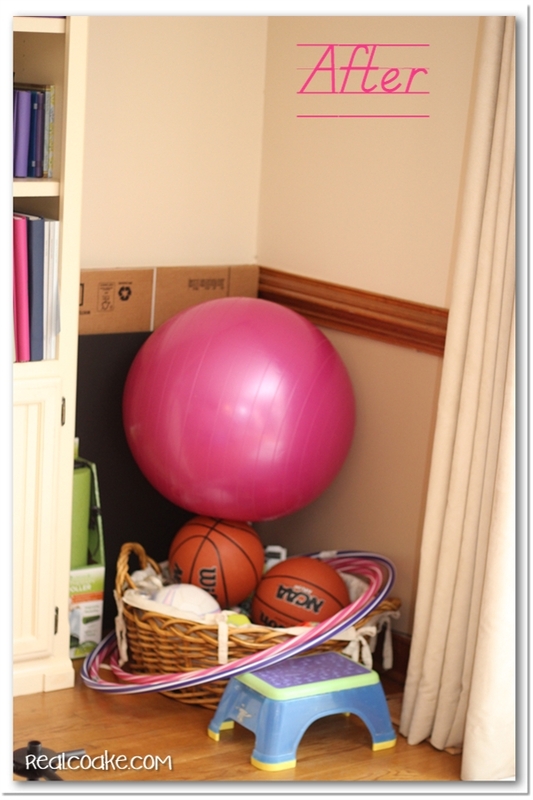 This corner of the room now holds all my and the kids fitness equipment. It also has a few of my backdrops. It doesn't look super great at this point and I think it still needs some work, but it is functional. Snowflake thought I would want to use this in my Keeping it Real series…but I decided you can see me with no makeup and organizing in a regular post! 🙂 As you can see, I got rid of our bar stools and move the shelves together in this corner. I really like how it looks and the bar stools were always in the way and hardly ever used, so this configuration is working out well. We had some leftover shelving from another project. Mr. T cut me a square of it to cover over the whole in the corner between the two sets of shelves. We attached it to the shelves using command picture hanging adhesives. I still need to do a little something with this cut piece to pretty it up and cover the raw edges. But otherwise, Voila! One organized school area. We also use our kitchen table. We have a dry erase board hung on our coat closet door because it faces the table. It gets used a lot. I also have a shelf upstairs in the playroom that holds some of the materials and manipulatives that we don't need yet for this year. I let each of the girls pick 3 of the cubes that they wanted for their school supplies for this school year. Snowflake, my 11 year old, picked the top three cubes in this section. Pumpkin, my 6 year old, picked the middle three cubes. For both of their cubes, they have one cube that holds the books they need for this year. 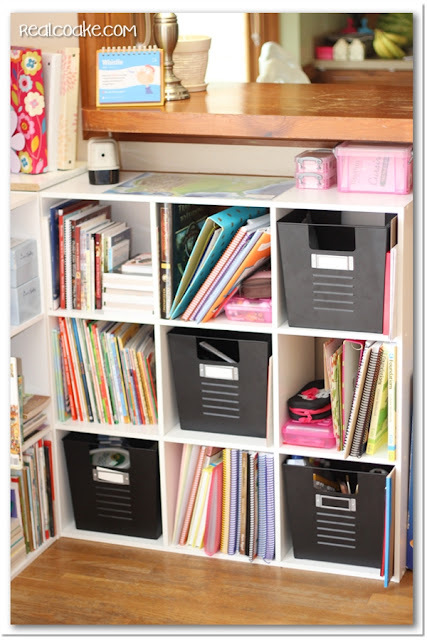 One cube holds their folders, workbooks and pencil cases. 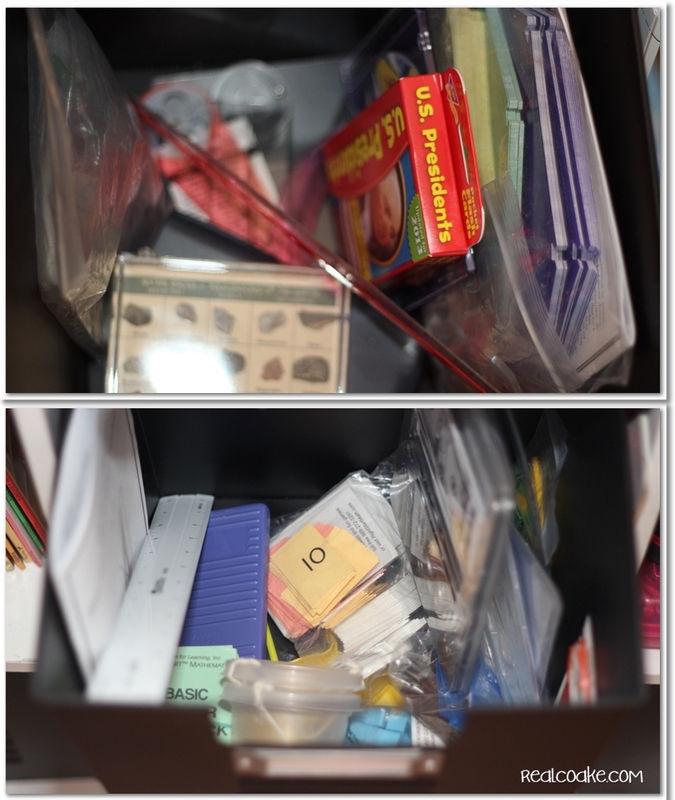 The metal bin holds their manipulatives and other small items that would get lost otherwise. The bottom row contains all my teacher manuals as well as two bins full of supplies. There are the two bins of supplies on the bottom row. One is miscellaneous supplies that we use for various subjects. The other bin is all our art supplies for our art lessons. These are the bins for Snowflake and Pumpkin. Snowflake's bin is on the top. This six set of shelves holds our reference materials as well as the little bins we need and About Spelling boxes. The three cubes with books that are not reference materials are the books for levels of our curriculum that we are not currently using, but will use in the future. On top of these shelves sits our new Mason Jar Craft and above that is our Zhuzh'd up cork board. The green bin is filled with all kinds of school supplies that we will need throughout the year, but don't need just yet. The girls know what all is in here and can get what they need as they need it. I added this basket this year. There were just always some items that wouldn't fit in the shelves. They usually ended up in a corner and then gotten forgotten. This year, with the basket, they will be right there and not lost or a big mess. 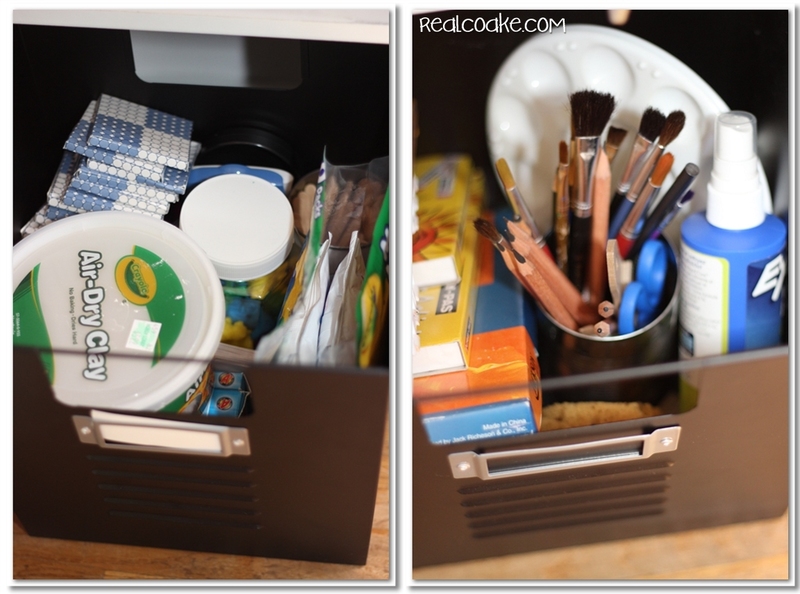 The basket will contain everything and keep it tidy and easy to find. Gotta love that! There you go. That is our school area. The pass through that you can see in the picture on the right, leads to our kitchen, which is where we do most of our schooling. 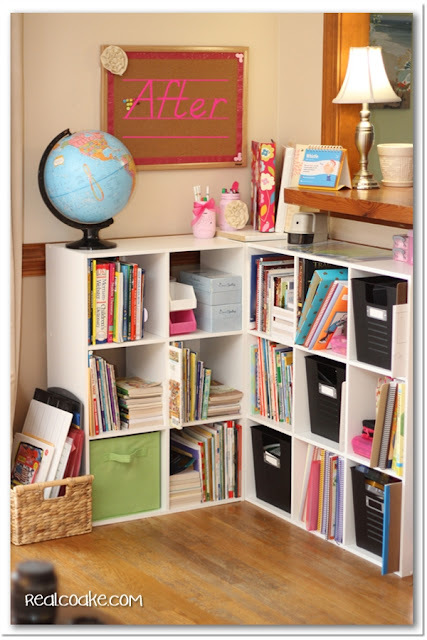 The shelves are in a very convenient location to keep everything and easily get to it. I still need to make new subject circle charts for the girls and we are ready to go for this year. I blogged about the subject circle charts WAY back in the beginning of this blog. I will link you to it and apologize that I had no idea what I was doing in blogging back then. You can see my subject circle chart on the cork board in the picture on the left (There are two of them. They both say “Today” at the top.). 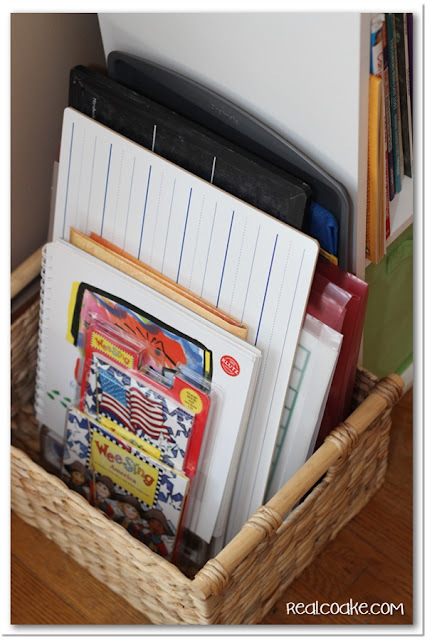 Essentially, I use them like the workboxes that many homeschoolers are fond of, they just don't take up the space of the workboxes and my kids get to pick the order of their subjects for the day. It works really well for us. When do your kids go back to school? 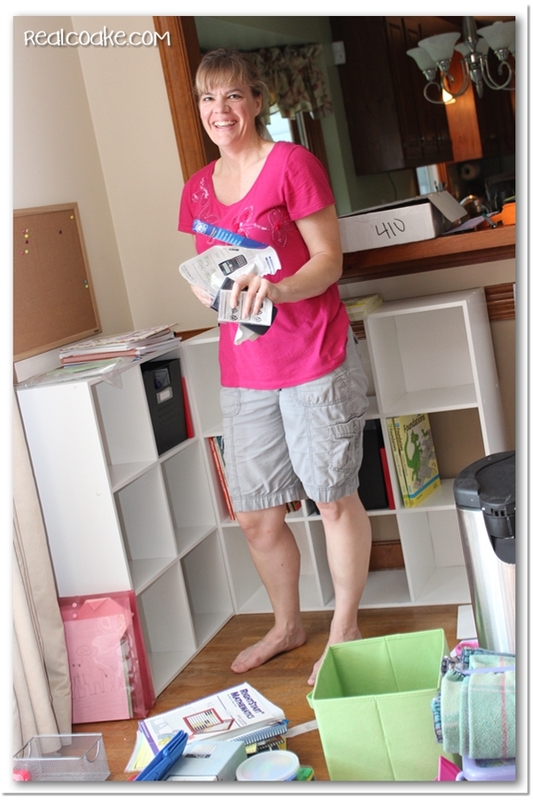 Any other homeschoolers have some ideas on how you keep everything organized? it looks good, all organized, ready for a new year. have you had our “back to school” yet? I love the hula hoop for exercise, well not for me but the kids. We are starting school on Monday. On Friday, after meeting the new teacher, we had to go hang out with the art teacher, we have priorities! Have a great home-school year! Thanks! No, we probably won’t start until mid way through September. We have a lot going on at the beginning of September, so rather than start and stop and start and stop, I’m just going to wait. Discovered you through It’s Overflowing – I’m a (newbie) homeschooling mum too! My son is 11 and we are still finding our feet this year – we h/s on the dining room table and I have a chest of drawers with his subjects/books in! I absolutely LOVE your set-up – nice to do it in “pink” for your girls. Thanks for showing what you’ve done. I love when people are able to organize in a chest of drawers. I think it looks so neat! I wish you well this year as you get accustomed to homeschooling. Hope both you and your son really enjoy it! Thanks for dropping by Atticmag and commenting on my grandson’s playroom. Your corner organization looks great. I am always looking for other ways to keep everything within easy reach. I love this post! 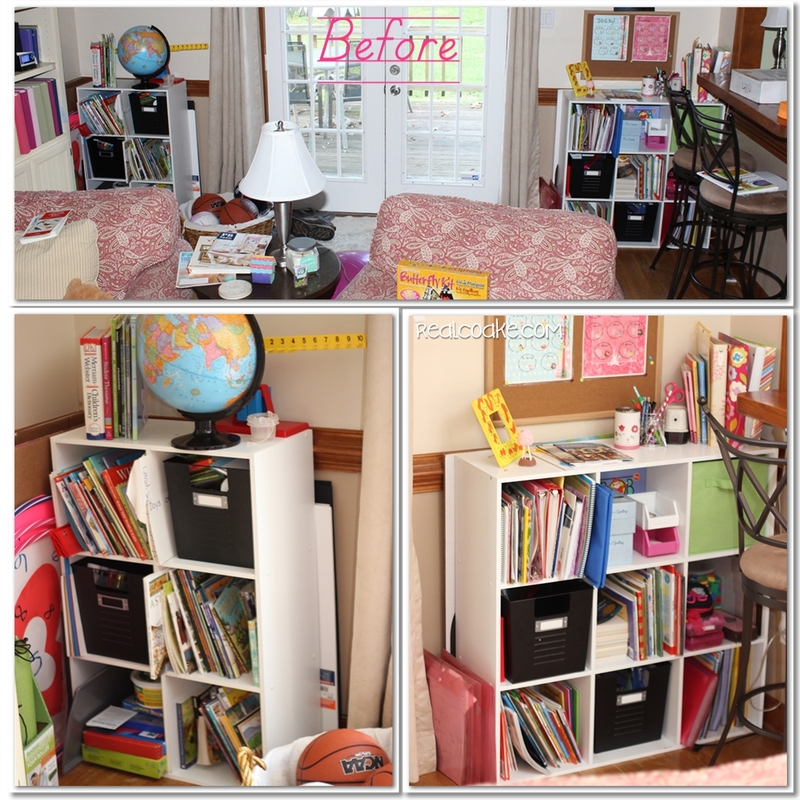 It’s really exciting to see how parents who homeschool arrange their materials so that it is incorporated into their homes. 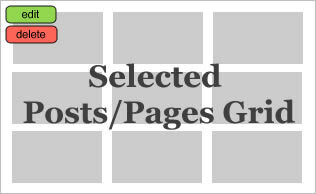 I love the layout and organizational plan that you have chosen. 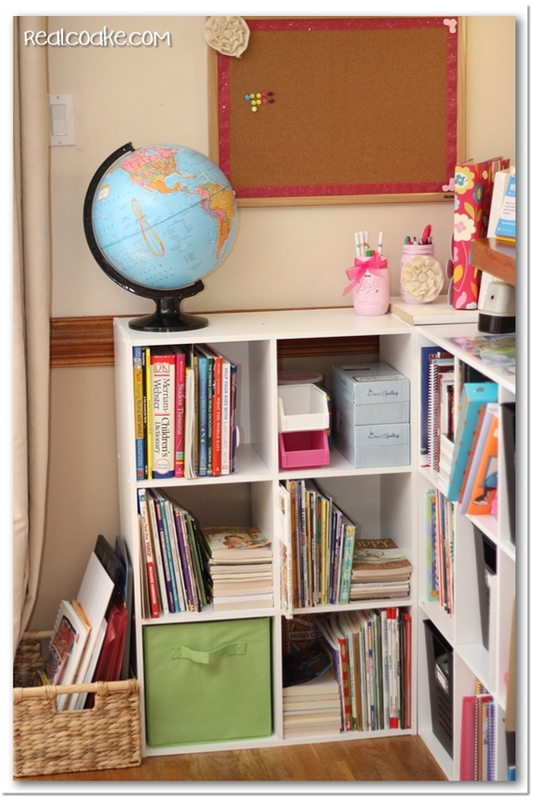 Tomorrow I have a post on homeschooling tips and I’m providing a link to this post. I think there are lots of parents who would enjoy it. If I have permission to use one of your photos to link here, let me know; otherwise I will still have a text link. Thanks for sharing! Thanks so much Libby! 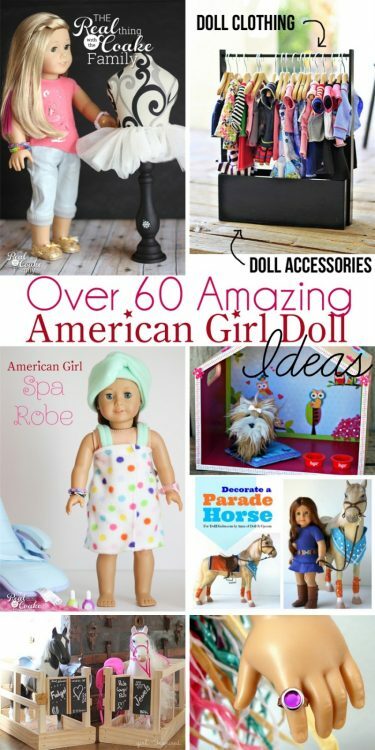 I appreciate your linking to my site and I loved the post! Thank you! I agree the book shelves are so versatile and a great price as well. We have some in our playroom as well. 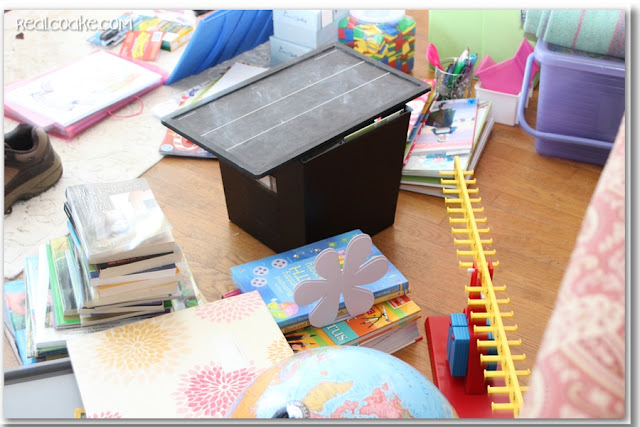 Are you having a challenge fitting everything in with losing all that space for your schooling? Hopefully you have got it figured out. I bet your son is enjoying having his own room. I’m kind of sad, my last homeschooler graduated. No poring through books, no lesson plans, I will miss it. Thanks! I can’t imagine having everyone graduated. I’m a long way from that, but I can imagine it would be both sad and a relief. I love seeing how others organize their homeschool stuff. I love how yours is pretty enough for the living room, we don’t have a separate school room either. Thanks, Allyson! I love seeing how others organize their stuff, too…sometimes it makes me drool to see some of the spaces people have. Of course, my house is too small for the spaces that make me drool. So, I tried to add some fun this year. I’m happy with it! Thanks, Pumpkin! I love you! where did you bought this green bin? The green bin is from Target. They have them in tons of colors. They come folded up in the closet/storage organization area. 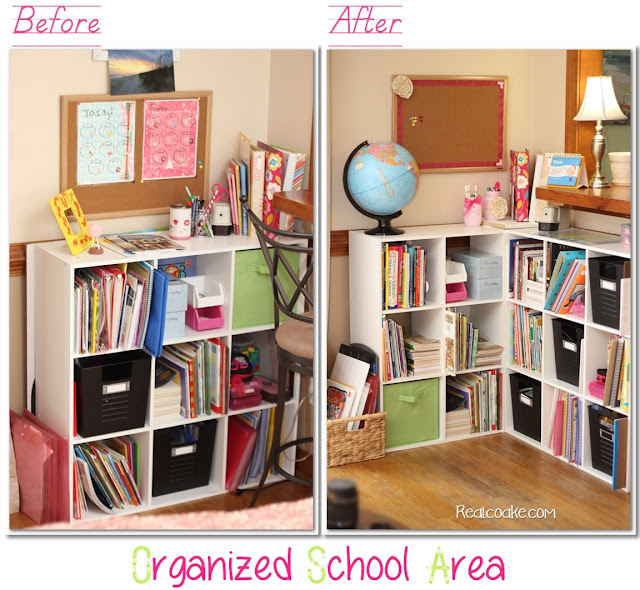 Hi, I love your home school organization, and am trying to rework mine ! Could you tell me where you bought the metal bins ? Thank you! I ordered them online a few years ago. I believe they were selling them at Target. I couldn’t find them locally, so I ordered them through their website or maybe Amazon. I believe you can’t find them anymore. Though you may find them if you do a google search. Good luck!